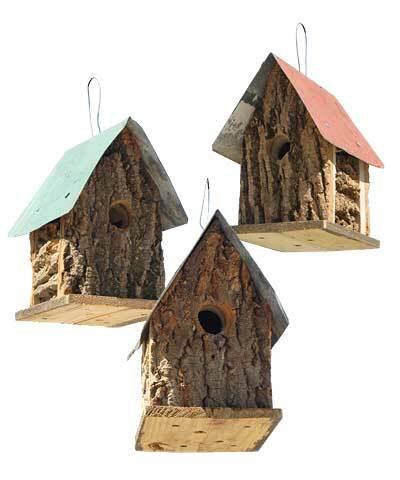 Offer small songbirds a fun, colorful retreat in your backyard with these Bird In Hand Summer Camp Bark Cabin Bird Houses. This set of three adorable, bark clad shelters not only invites small birds into your sanctuary; it also evokes the cabins from your days at summer camp for a wonderful garden memory. Each shelter is crafted from reclaimed and repurposed materials, for a green hint in the yard, while the colored roofs capture attention. A 1.25" diameter entry hole on each front panel allows small birds to roost in each home, and a pitched, metal roof protects the interior from the elements. Significant drainage holes on the flat base of each abode help the nests remain dry, and gaps beneath the roof overhang provide ventilation. The repurposed wood body of each piece forms a lasting nesting spot, and the bark exterior furthers the rustic motif. Aged red, green, and black roofs bring striking color to your yard, and a metal hanger atop each makes it simple to place these units on a hook or branch. Rest the level base on a post or attach it to a pole for a different mounting option. Help your backyard birds find a fun roosting spot by adding these Summer Camp Bark Cabin Bird Houses to your yard. Made in the USA. Note: This package contains 3 Bird In Hand Summer Camp Bark Cabin Bird Houses. One of each roof color (red, green, and black) is included. These products are handcrafted by the Amish using reclaimed and recycled wood. As such, each individual item may vary slightly.